By Lauren Carroll on Wednesday, July 29th, 2015 at 3:06 p.m.
Did Hillary Clinton’s use of a private email account put national security information at risk? That’s the question that’s been raised in the past few days as new information has been reported and at times misreported. We find it an impossible question to answer. Our research shows the evidence isn't clear cut. We do know that the idea that classified information would be in her emails runs contrary to Clinton’s own narrative. Since she first addressed her email habits in March, she’s said she didn’t interact with classified information that way. Rather, she viewed sensitive information in hard copy in her office and through other secure methods while traveling. The controversy has been fuel for the House Benghazi Committee, whose members are interested in how Clinton’s email choices affected the 2012 terrorist attack on a diplomatic compound and its aftermath. Here, we’ll review the new evidence and what it tells us -- and doesn’t tell us -- about Clinton’s tenure as secretary of state. The new evidence is intergovernmental memos from two government watchdog agencies: the Inspector General of the Intelligence Community (IGIC) and the State Department’s Office of the Inspector General (OIG), both of which are independent of their respective agencies. The Benghazi committee asked the two offices to review the email practices of former secretaries of state. The reviews looked at the State Department’s process for publication of 55,000 pages of Clinton’s emails, which she provided to the department last fall. The memos started to circulate July 24, when the New York Times reported that the Inspector General of the Intelligence Community had sent a security referral to members of the executive branch. The security referral is essentially a notification that classified information might exist in a location outside of the government’s possession (in this case, Clinton’s private email server). We should clarify that the New York Times originally and incorrectly said the inspectors general requested a criminal investigation into Clinton’s email use -- as opposed to a security referral -- but the newspaper later issued two corrections. The referral is in connection with Clinton’s account, not whether Clinton herself mishandled information, and did not allege criminal activity. So what classified information did they find in Clinton’s emails? We don’t really know. The Inspector General of the Intelligence Community reviewed a 40-email sample of the 55,000 pages and found that four out of the 40 contained classified information that "should never have been transmitted via an unclassified personal system." These four emails have yet to be released to the public. One of the memos said the State Department had inadvertently released classified information to the public in one of the thousands of Clinton emails the department put online earlier this year. However, neither the Inspector General of the Intelligence Community nor the State Department will say which email has the classified information. Journalists have been digging through the emails and have yet to flag anything that seems like a revelation of sensitive information. What’s more, none of these emails were marked "classified." Without a label, it’s nearly impossible to prove whether Clinton or someone who emailed her passed along classified information, whether willfully or negligently. We don’t know if the sender knew the information was classified, where they got their information from, or who declared the information classified in the first place. Does this mean Clinton was wrong to say there was no classified material in her email? Not necessarily. As backwards as it may seem, these two assertions -- Clinton’s claim that she did not have any classified information in her email and the inspector general’s claim that she did -- could both be partially accurate. This is primarily because the State Department disputes whether the information was classified. Agencies regularly disagree about whether information should be classified, even arguing over lines within the same document, said Thomas Blanton, director of the National Security Archive. If the intelligence community declares something classified from its perspective, that does not automatically trump the State Department’s own decision that the same piece of information is not classified. Let’s say Clinton learned a piece of information -- "Darth Vader is Luke Skywalker’s dad" -- from an official at the CIA, who told her that information was classified as top secret. Then separately, one of Clinton’s aides within the State Department said, "I learned from one of our Imperial sources that Darth Vader is Luke Skywalker’s dad." As the secretary, Clinton had ultimate authority to declare that "Darth Vader is Luke Skywalker’s dad" is unclassified -- which she could do by simply leaving it without a label -- because the information originated in the State Department, despite the fact that it also originated in the intelligence community. However, if information came solely from the CIA, and it ended up in Clinton’s email without the proper classification marking, that could be problematic, said Steven Aftergood, director of the Project on Government Secrecy at the Federation of American Scientists. Ultimately, both Blanton and Aftergood said the memos tell us much more about the turf war between State and the intelligence community than they do about how Clinton handled her emails. "What leaps out at me is how dysfunctional our classification system has become, where you have different agencies and different offices arguing over the mere existence of classified information," Aftergood said. "What does it say about Secretary Clinton? It doesn’t say anything about deliberate or negligent mishandling of classified information." Blanton said, "The intelligence community is trying to override State Department determination. ... It doesn’t say anything about Mrs. Clinton’s own activities." Regardless, there’s still cause for concern from an information security perspective about Clinton’s decision to exclusively use a private email server, Aftergood noted. Even if it isn’t officially classified, information sent to the secretary of state is, by its nature, sensitive. Wait, then why has the State Department redacted so many of the emails they’ve already published? Yes, many of the emails already out in the open are heavily redacted, but that’s a slightly different situation. What we’ve been talking about are emails that contained information that was supposedly classified at the time the emails were sent. The redactions in the emails that the State Department has released so far are because the department decided the information was classified later -- meaning no one mishandled this information by sending it initially without a classification label. This sort of classification upgrade occasionally happens if new information comes into play that affects the sensitivity of the information. Additionally, some information is exempted from Freedom of Information Act releases for other reasons -- such as privileged communications between government officials. The question of how Clinton dealt with national security information isn’t going away anytime soon. Despite the dispute between the State Department and the inspectors general, the department still plans to release another round of Clinton’s emails Friday, July 31. 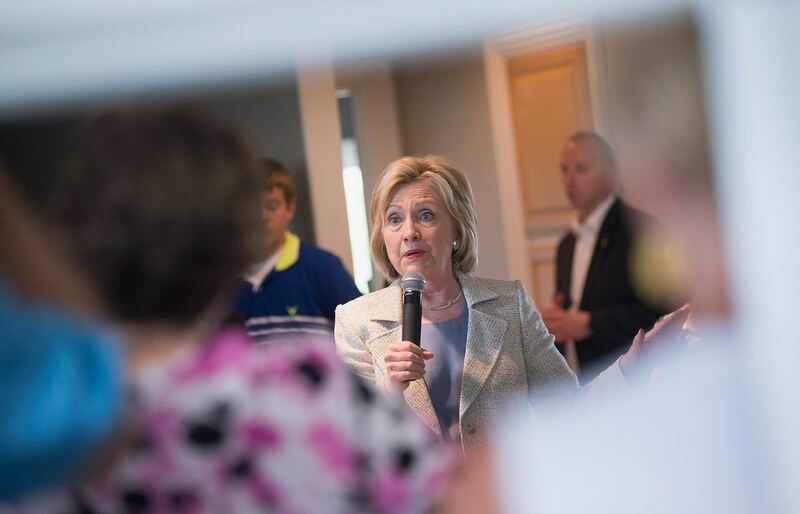 The Benghazi Committee is expected to grill Clinton about her email use in an October hearing. But as of today, we don’t have nearly enough information to say whether Clinton mishandled classified information. Of the latest news, Blanton said, "It’s not proof."